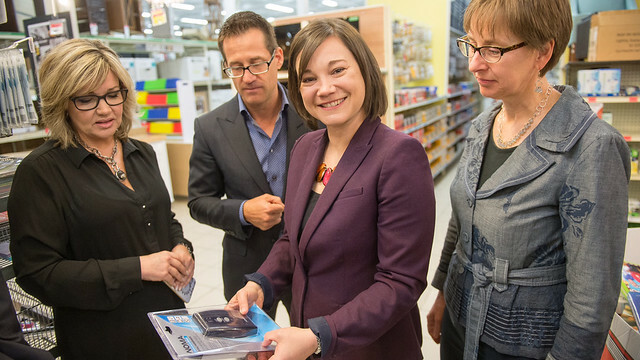 Albertans will save money with instant rebates at stores for energy-efficient home products, with a new retail campaign running April 28 to June 11. Point-of-sale rebates of up to $30 for items such as programmable thermostats, water-saving devices, smart power strips and heavy-duty timers will help Albertans save money while conserving energy. The rebates will be available at home improvement stores across the province. The incentives are part of Energy Efficiency Alberta’s Residential Retail Products Program. A second six-week retail campaign will be offered in the fall. Details on eligible products and related information are available on the Energy Efficiency Alberta website. Retailers across Alberta will have these products available in store and will promote the rebates through flyers and other advertising. The government's Energy Efficiency Advisory Panel recently recommended a number of energy-efficiency programs to help Albertans reduce their energy bills and greenhouse gas emissions. Today's announcement is one element of that suite of programs. Instant Rebates: You can receive instant point-of-sale rebates on eligible products, such as LED lights, programmable thermostats, water-saving devices, smart power strips and heavy duty timers. There are 579 national, western Canadian and independent retailers participating. Consumers can buy 25 of any one product per transaction. Example, 25 of one type of LED light, 25 of another type of LED light. Similar programs in other Canadian jurisdictions also have incentives that reduce the up-front cost of energy-efficiency products. In total, Albertans save $4 for every $1 put into the Residential Retail Products Program. The $8.5-million investment in the Residential Retail Products Program will generate nearly 250,000 gigajoules of saved energy, which is enough to meet the energy needs of 1,675 homes for one year. This produces over 307,000 tonnes of carbon dioxide equivalents (tCO2e), which is roughly equal to removing 41,000 personal vehicles from the road for one year. Over the life of these energy-efficient products, this investment will deliver $45.4 million in cost savings to participating households – real reductions on utility bills that can be spent on other priorities in households.